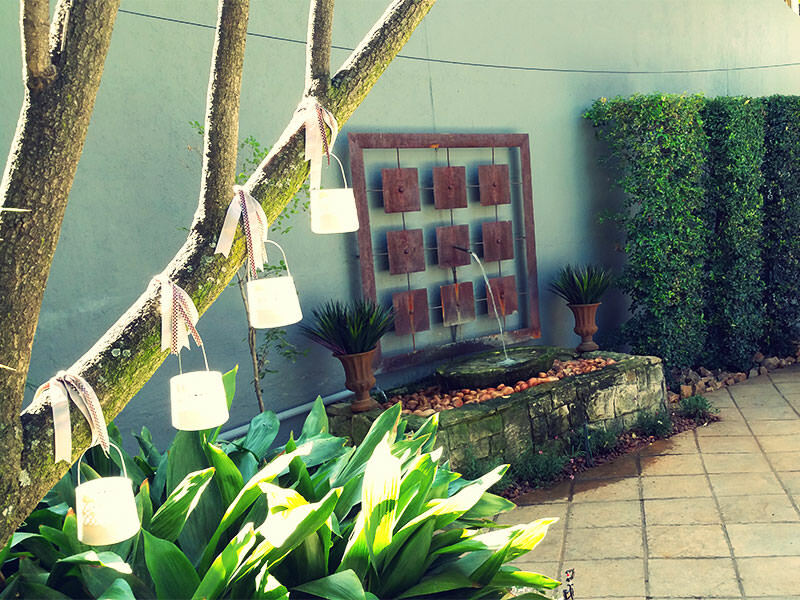 Reconstruction of an existing fountain that was not working any more into an eye catching focal point by the front door of a luxury home in Waterkloof. The existing fountain did not compliment the house anymore and we needed to reconstruct it into something exiting. The area is visible from all angles. This meant that we must use elements that looks stunning form all the different angels. We decided to make use of a fountain ring. It is something different and stimulates all the senses. We had to reconstruct the existing fountain from a convex shape to a concave shape, re-seal it with resin and finish it off with a nice square bullnose. It was painted the same color as the house. The fountain was filled with water and the garden around it was re-designed into a more usable area for the butler to wash the motor vehicles. The new fountain looks good from all the different angles. This was a good challenge for LBL in terms of a ring feed irrigation system. The site was assessed and the geological engineer pinned the spots with blue spray paint where water could be drilled for. There was about three different areas but only the one spot was suitable for the truck to get into and to be stable enough for it to drill. The water table was reached at approximately 85m deep. Sleeves were sunken and the bore hole pump was connected. Electrical work was done by a professional electrician and the necessary certificates was obtained. Two JoJo tanks on a solid 75mm concrete floor was placed as close to the borehole pump as possible. The irrigation computer with relay switch was installed close to the JoJo tank together with the pressure pumps. 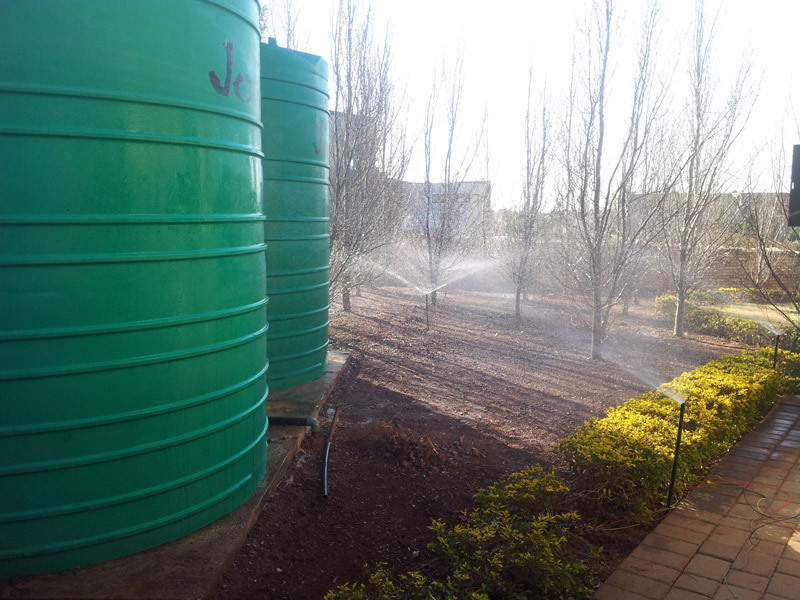 The tanks were filled with water and the irrigation system connected. The system irrigates 16 stations all with excellent pressure. Privacy was our design aim. The house is surrounded with double story houses and we had to incorporate different bushy trees with very stylish wood work to accomplish the objective. The area for gardening was also not very big and we had to accommodate two very play full bulldogs. Moroccan pots with different fruit trees was planted along the side of the house with a very interesting fountain to accentuate the path to the back where the entertainment area is. The front garden was designed with lots of detail. Cobbles with pebbles edging out all the pathways, giving it a nice border. A rusted fountain at the front door with lots of lavender and different color grasses to accompany the stepping stone pathways that all leads to the back where the very private entertainment area is. Everything flowing into each other. This is an ongoing project since 2003 regarding construction and renovation as well as the garden that is designed in phases. The most important part of a residential garden is by far the entrance areas. In the case of this design it was very difficult to design the gate entrance first because of the renovations going on for such a long period of time and it is also a panhandle site. The front door construction was done first so we could start the design there. This area received full sun for the whole day and was not very user friendly when it rained. We covered it with a glass roof construction so that there is still enough sunlight coming through but it is covered when it rains. It makes conditions also much more suitable for planting (hot house effect). A very nice wooden front door that is a focal point on its own was hanged. We decided to divide the garden into different rooms. 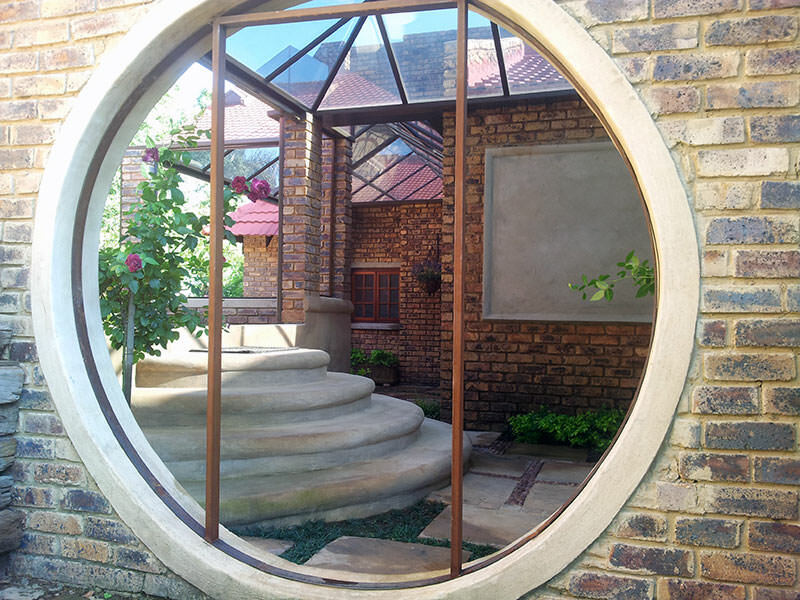 The front door area was divided from the herb garden by building a wall with a huge circle hole inside. This is something different already. Half circle steps was built to come down to the front door and plastered with a very rough texture to make it non slip. All the existing paving which consisted out of half bricks was taken out. The area was leveled out and compacted. Two fountains where installed for tranquility. Five rusted spouts was placed next to each other with water running into a built trough (focal point from the kitchen window next door) A smaller fountain on the opposite wall by the front door with exceptionally well thought trough planting and paving was done. The criteria were to have dry walk ways but still accentuated planting. Circular paving stones where laid to enhance the circle design. The combination of circles and squares worked out very well in this particular design. Neighbours can be difficult in some situations and we had to make a plan for privacy. The neigbour did not want us extend the wall. Their yard was on a higher level as the one we are busy designing. We made gabions into the required height, stacked them on top of each other and filled it with dump rock. To make it a bit interesting we used split pole in combination with hedge plants to cover the area up and to give us the privacy in our design that we required. Paving was done in the same design as by the front door the give the design the necessary flow. Three columns was build and big rusted pots were places on top of it for citrus trees. A service area is a very important area in a design but could also be a very untidy spot. This is normally where a household is operated from in terms of cleaning, washing and dust bins. This area should preferably be out of sight. We constructed a new higher wall, plastered and painted it. The ground level was raised so that it is one level and the same paved design with a slight slant was installed. Half circle steps to go down into the garden were built and a huge rusted pot with a Wisteria creeper was placed strategically to grow over an arch. Smaller rusted urns was place evenly on the opposite side with ball shaped Durantas to soften the area and also to give it a bit of colour. Very modern wash lines that can fold away where placed onto the walls to make the area very neat and tidy if not in use. The design was finished off with a rusted sculpture as a focal point from out the kitchen door. After years of renovating and construction we could start with the outside gate and panhandle. All existing plant material was removed. A new intercom system was installed and the soil has been prepared. Leopard trees with rusted huge round pots on pillars where spaced evenly and we made use of mass planting in between with Duranta Sheena’s gold & Agapanthus spp. with their mauve flowers. Ticky creepers where planted to cover the unsightly walls. Right at the entrance of the gate there is an inspection hole for sewerage. Not very appealing so we decided to cover it up with a pedestal and a big fish on top. This is an outside area far away from the initial house and must preferably be low maintenance. 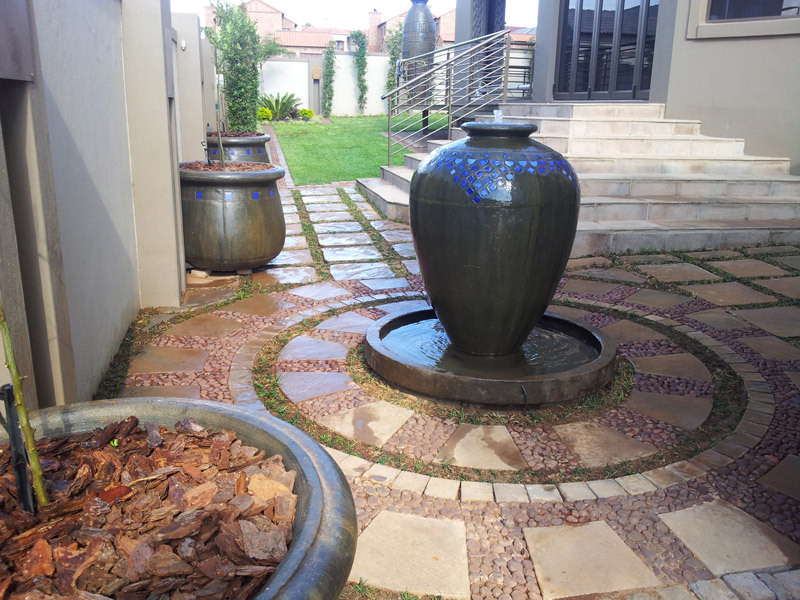 We made use of a lot of different pebbles, stones and gravel to keep the design water wise and low maintenance. Tulbagias with mauve flowers where planted at the back for colour and rock roses in front for a bit of foliage. We made use of different curbing around the area to help keep the garden neat and tidy. All plant material in this specific design is indigenous to help us conserve water. A big area under old huge trees was our next challenge. We had to design a Jungle gum/ play area for a toddler that turns one year old. He is still very small but we needed to keep into consideration that he would not be so small for too long and that the area must be suitable for playing at least for the next 10 to 15 years. We started with a race track where he could ride his plastic scooter with friends and also learn the most common road signs. The area was lifted up 500mm, a stone wall was built around the given space and the whole area was filled with gravel and river sand. The track was built and painted with red and white stripes. A chalk board was custom made for the need of small as well as bigger children. In this specific area the objective was learning. Everything that we could incorporate to stimulate a child we tried to bring into the design. An existing telephone pole was used for a climbing pole. We drilled 12 mm steel through for climbing with painted tyres underneath. Huge pencils made out of poles were planted in the ground next to the chalk board and a hop scotch just next to it. Big cement feed painted in different colors was the walk way to the jungle gym. Colourfull beams where laid on the fake grass floor for balancing tricks in different lengths. On their way to the jungle gym a massive tractor tyre also painted in a bright colour was made into a sand pit. We used specific play sand mixed with cinnamon to keep the cats away. The jungle gym was constructed over the race track and into a big tree next to the swimming pool. The whole area lends itself so that we could design the tree house/jungle gym into different levels. The two levels are joined with a small three step ladder. On the first level a colourfull slide was mounted. The higher level we used for a swing/ rope. The space under the jungle gym was incorporated into an open play area with a swing made out of an old tyre and a painted rope ladder next to it. The pool and the play area were divided with a colourfull painted picked fence to keep the children away from the water. Garden lights for evening playing was also installed on yellow painted posts. Old jam tins was colorfully painted and drilled onto the posts under the jungle gym and seedlings planted inside. Our objective was to stimulate all senses, to make it child friendly and useable for the next 10 years of his childhood. 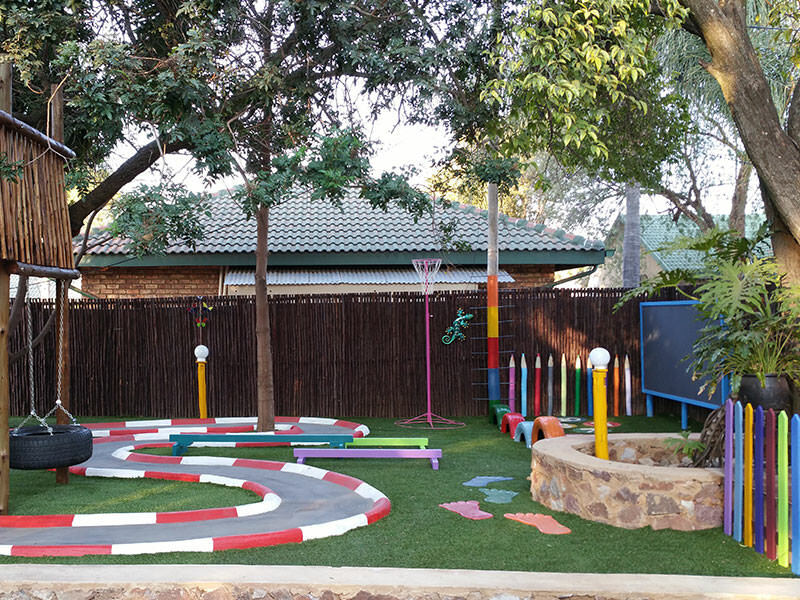 The objective for this design was to develop a garden where you can relax and experience a bit of tranquility as well as a play area for a child with the ability to become a very good golfer. The area that we had to work with was a townhouse garden, not very big, and it was quite a challenge to bring all of the above requirements as well as the designers elements into consideration. The landscape was prepared, a good irrigation system was installed and the putting greens preparation started. With completion of the putting green the rest of the garden was designed with lots of foliage plants to keep the design almost maintenance free and easy to maintain. The garden will provide a lot of color throughout the year with the use of lots of textured plants, some with vibrant colors and others with flowers at certain times of the year. The putting green looks neat and tidy although the year, and is maintenance free. The whole garden was designed with the objective to look good at all times and to be a low maintenance garden. This is an ongoing project since 2004. We strive to upgrade this garden with every phase. With the first phase of this design our objective was to maintain the garden and make it more plant friendly. We installed a good quality computerized irrigation system and decided to break up most of the existing paving. The garden had nice big old existing trees that provided a lovely shaded area with high foliage that gave us a nice canopy to work under. Most of the plant material selected was shade loving plants. We proceeded with a bit of construction for steps and flower beds to give the garden a bit of depth. The challenge in this garden was to be able to choose the right plant material for deep shaded areas. The landscape was also divided into small rooms that was designed in separate sections. It gives the design the element of mystery. Around every corner something different attract attention. This garden was totally overgrown and a very beautiful house was hidden under big untidy bushes. Our aim was to tidy up the garden and to remove all unwanted plant material. With the site cleaned, we started with the different phases of the design. 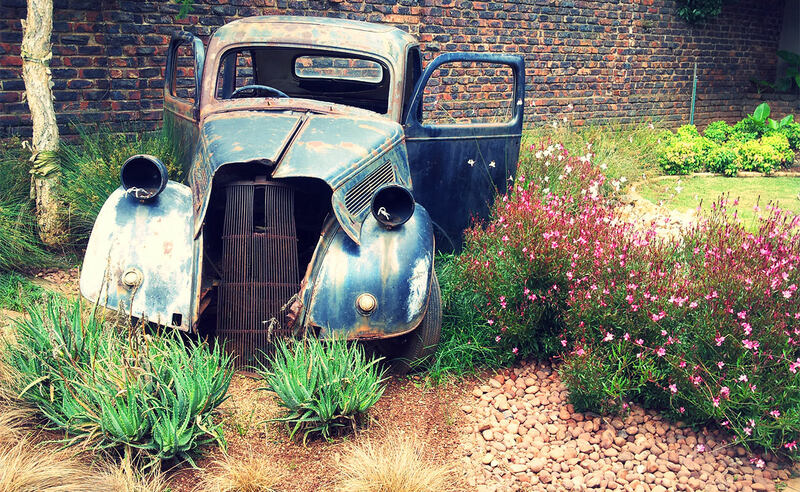 Challenge number two was to get the old 1938 Ford Anglia vintage car lifted over a two meter high wall into the area where it would form part of the landscape design. A few water features were constructed all in different phases but, the criteria was to keep the design elements the same throughout the project. Thus we worked with the same hard landscape supplier. As you would walk through the garden you would notice that all the pots used are the same color and texture but different shapes and sizes. That would be the element in this garden that gives the design, the element of continuity. With all the existing foliage removed we had a lot of open bare soil areas. Neighbors also now had a good view into the area. Our intention was not to open up the land but to redesign in such a way that it would be a well thought out concept. A few hedge plants as well as big trees, suited for the size of the garden, was planted to give us a well developed canopy when the trees was fully grown. Focal plants were placed very strategically and fillers plants were used where necessary. With each phase we developed the garden more and more. An outdoor shower was added as part of the main bedrooms bathroom with a glass roof for bathing in moon light. The whole bathroom was redesigned to form a part of the new developed garden. Old slate paving was replaced with nice stepping stones with a lot of detail. A tranquil corner was created outside the main bedroom for private coffee drinking with someone special on weekends. A sandstone & wrought iron table with two chairs complemented the area and the style of the design very well. A beautiful pot with water softly flowing over it gives the tranquility the area needs. The front door is always a very important area and I feel that it display the character of the house. It must be a inviting to go inside. 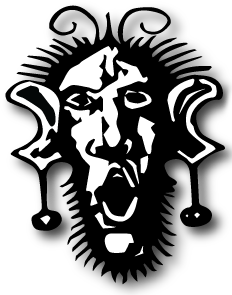 LBL kept the design very simplistic but with enough detail to make it interesting. 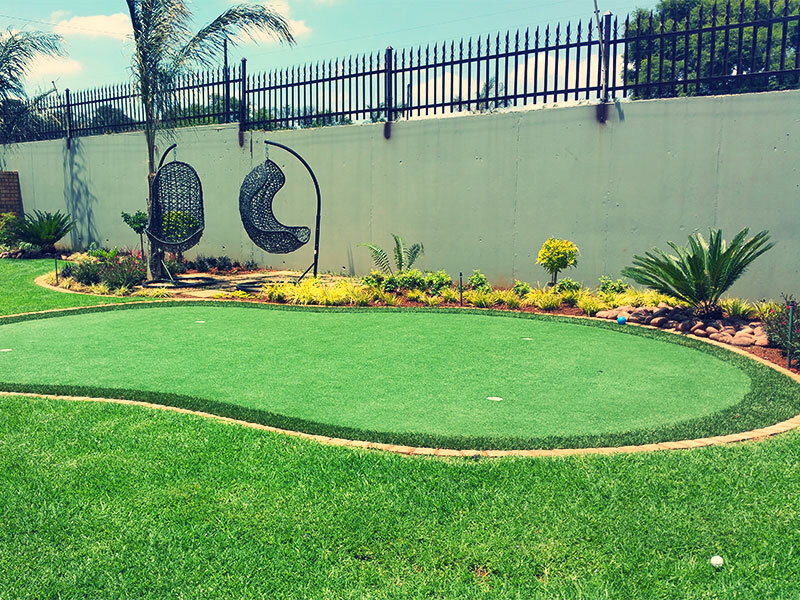 The grass patch was designed in a paisley shape with small cobble blocks to round it off. Foliage plants were used to give color and texture. As you would walk through the garden every different area is designed in a way that it is completely different than the other, but still complement the rest of the design. Our objective was to design a landscape that is very accessible for someone that loves working in the garden but, with back & knee problems. Our client also loves all things nice, so we had to work with al lot of garden ornaments and small detail. LBL decided to lift the levels of the garden to give it a three dimensional overview and also to incorporate a wooden deck that comes out from the living room onto the same level into the garden. With small steps and low to waist high levels, the construction work was constructed with a lot of precision so that the area would be easily accessible. The idea with the building of the flower boxes was also to construct each one in a different shape and texture. Some were plastered, painted and some were just left as is. We also tried to incorporate all the different materials that we had to work with. Brick, cement, paving, wood, water and natural material, plants and grass. With the construction completed, garden lights were installed for night mode, the garden beds were prepared with good soil and walkways were compacted for paving. With all the prep work out of the way we could proceed with the planting of the areas. 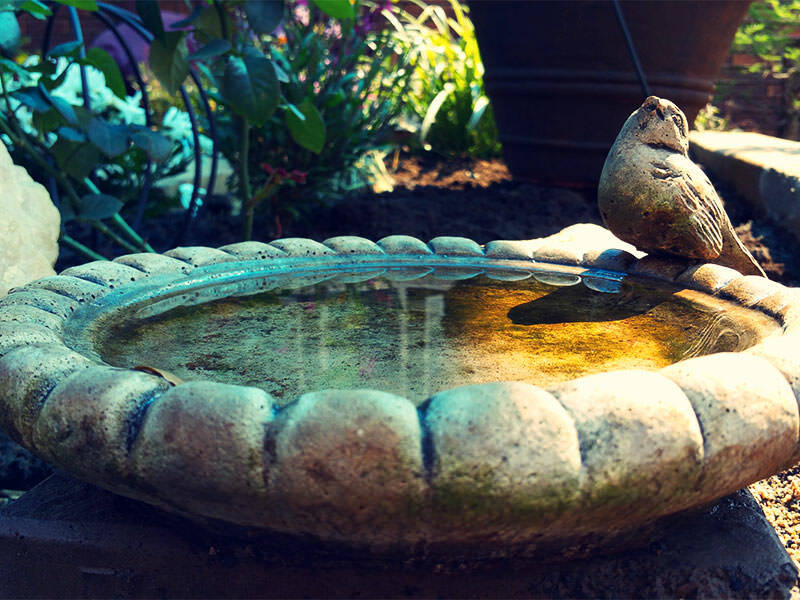 A couple of small water features were incorporated for the sound of water and to attract bird life into the garden. Each flower bed was designed in its own style. Japanese style with excellent quality bonsai trees, cultivated by the owner himself, Old English with a lot of color that also gives a country feel with a small tea garden set to have a cup of tea in the mornings. Copyright © 2017 Letitia Bruwer Landscapes. All Rights Reserved.